We are celebrating our 90th year of service! 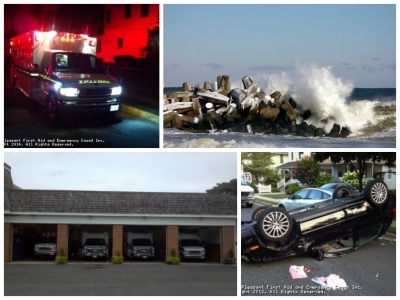 For more than 90 years, the Point Pleasant First Aid Squad & Emergency Squad has been providing free emergency medical services to friends, visitors, and neighbors in the communities of Point Pleasant Beach, Bay Head and Mantoloking. All of the organization's members are volunteers who donate their time to answer emergency calls and provide community services around the clock, 365-days a year. We are trained to recognize and treat an array of medical problems ranging from heart and asthma attacks, diabetic emergencies, and respiratory problems to fractures, bumps, and bruises. Training is provided FREE for any potential squad member. Not knowing what you may encounter is part of the challenge of being a volunteer first aid squad member. As a squad member, you can make a difference in a persons life by providing the first, vital link in the pre-hospital environment for the patient. Your caring and EMS training can help ease the patient into the emergency system. Upon joining, you will begin riding as an observer. As your training progresses, you will gradually begin helping out with first aid. Please keep in mind that you will never be thrown into a situation for which you are not ready. This site has been viewed 168,307 times.